Bananas. 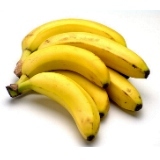 Containing three natural sugars - sucrose, fructose and glucose combined with fiber, a banana gives an instant, sustained and substantial boost of energy. Research has proven that just two bananas provide enough energy for a strenuous 90-minute workout. No wonder the banana is the number one fruit with the world's leading athletes. But energy isn't the only way a banana can help us keep fit. It can also help overcome or prevent a substantial number of illnesses and conditions, making it a must to add to our daily diet. Brain Power: 200 students at a Twickenham (Middlesex) school were helped through their exams this year by eating bananas at breakfast, break, and lunch in a bid to boost their brain power. Research has shown that the potassium-packed fruit can assist learning by making pupils more alert. Constipation: High in fiber, including bananas in the diet can help restore normal bowel action, helping to overcome the problem without resorting to laxatives. Rose Bushes: Blend one skin (soft Part) with blender full of water and pour on base of Rose Bush. Promotes healthy roots and new growth.